At Pixel Fish we do more than just provided website hosting, we provide fast & reliable website support & maintenance for hundreds of Australian businesses. We are committed to providing our clients with the very best experience depending on their individual needs & requirements. We have teamed up with Australia’s premier web hosting provider Digital Pacific to provide tailored hosting environments for our clients depending on their individual needs & requirements. Our super fast Australian based servers have been specifically engineered for WordPress are our local servers are perfect for SEO focussed businesses. With a secure data centre in Pyrmont, our hosting infrastructure is built on a high grade Dell Enterprise servers. Our client’s love us for our ongoing Support & Maintenance. With our expert support team, our clients know they can email, call us or even pop into our office for a chat. Up-to-date website software is paramount to the security and performance of every WordPress website. With our PixelProtect Plans you’ll never have to worry about updating your websites plugins and themes. We update WordPress, Plugins & Themes to ensure every website runs smoothly and securely. If our clients find any bugs & glitches, we will fix these as part of our commitment to our clients. Up-to-date website software is paramount to the security and performance of every WordPress website. With every PixelProtect Plan you’ll never have to worry about updating your website’s plugins and themes. We update WordPress, Plugins & Themes to ensure every website runs smoothly and securely. If our clients find any bugs & glitches, we will fix these as part of our commitment to our clients. At the heart of every Pixel Fish website is an all encompassing 360 degree approach to security. Our security practices include server hardening scans, firewall protection, nightly backups, monthly software updates and our commitment to resolve any issue that may arise in a timely manner. Our Professional Plan is constantly monitored for security and is used exclusively by our clients, ensuring your website’s speed and performance will always be of the highest level. Our Essentials Plan provides small businesses & start ups with all the essentials and is an entry point for website & email hosting and phone & email support. Our Professional & Ecommerce Plans deliver super fast, secure and reliable website performance from a dedicated hosting environment. Are you requiring your own dedicated server or managed VPS? Or would prefer to host your own website? Are you requiring support for Emarketing & Digital Marketing or ongoing SEO Optimisation? 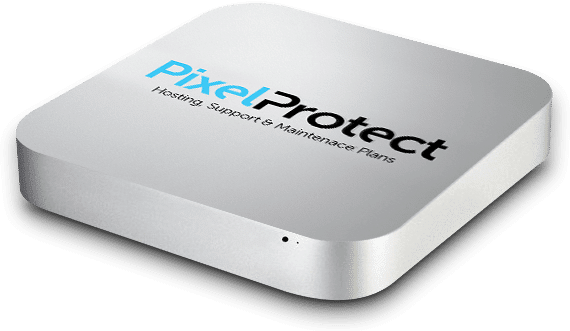 Pixel Fish can tailor a PixelProtect plan to suit your individual business needs.